Icelandic twin sisters Jófríður and Ásthildur form the band Pascal Pinon. The name itself is a subtle variation of Pasqual Pinon, known as the Two-Headed Mexican, a circus performer from Texas in the 1900s who was basically a bit of a freakshow. 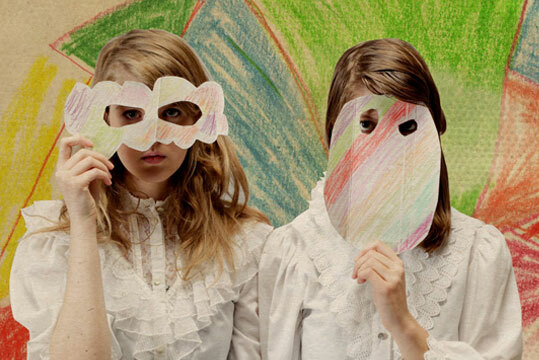 Yet there’s nothing freaky about Pascal Pinon and certainly there’s no link between that and their music, but it does show their sense of humour that they play on the fact that they are just so closely linked together as sisters. The girls who are from Reykjavík in Iceland are eighteen and are in school studying classical music. Though they have expressed their love and talent for writing from a very early age, apparently they used to dictate poems, songs and stories to their parents who would then record them and started writing and producing music together aged fourteen. Twosomeness is their second album. Using each others strengths and weaknesses, Jófríður excels at the song writing and Ásthildur concentrates on the arrangements, backing vocals and playing instruments. And both their skills combined they make some pretty special songs. Take a look at their talent here in their video for Bloom taken from Twosomeness. They’re next playing live at Hoxton Bar & Kitchen in London on May 29. Buy tickets here and download their music on iTunes.